In Nicholas JR Whites’ photograph “David at Kearvaig Bothy, Cape Wrath, Scotland,” an older bearded man gazes out a window. As viewers, we are separated from him; his distance from us underscored by the white wall and window behind which he calmly holds his coffee. The image is simple, but the concept of distance it conveys is complex. Photographs and words are more complicated than we often admit. Photos are icons of the world, slices of vision captured on film, paper, or digital file. However, these glimpses of the recognizable world often lead us into new conceptual territory. Words too are surprising. Take for example ‘distance,’ one word that sprang immediately to mind when viewing White’s photograph. The first two definitions of the word ‘distance’ have nothing to do with measured space or length. Instead, the primary meaning is discord; the secondary describes a portion of time. This polysemous nature is fitting for White’s work. These multiple meanings—discord, time, and physical space—perfectly describe White’s Black Dots project. 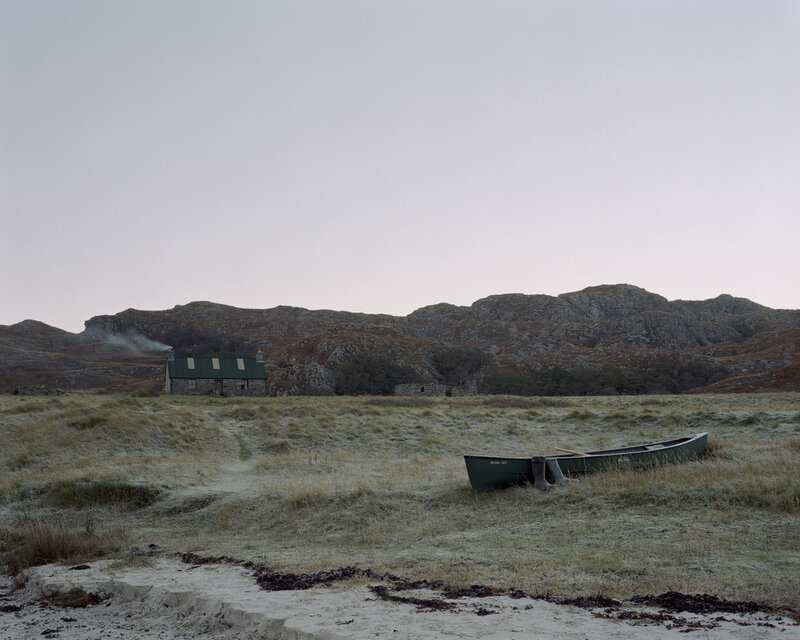 In the series, White photographs the “bothies”—secluded mountain shelters scattered throughout the landscape of the United Kingdom—and the men who visit them. ‘Bothy’ is a Scottish word for ‘booth.’ In the 19th century, the word described a temporary shelter utilized by shepherds or hunters, or more commonly, quarters for unmarried, male farm laborers. Since the mid-20th century, however, they have been primarily used as shelters for hikers and outdoor adventurers. Most are now maintained by the Mountain Bothy Association. White began the project after looking at various accommodation options when on hiking trips to the Scottish Highlands. “As soon as I discovered [bothies] I became fascinated and began reading up on their history. I had a huge map of the UK pinned to the wall above my desk and I started dropping pins on all the bothy-locations, eventually plotting a route covering the English Lakes, Central and North Wales and Scotland.” The title of the series refers to the black dots that marked these structures on older ordnance survey maps. Yet, the series Black Dots is more than merely a survey of these out-of-the-way structures. White’s photographs explore the unbreakable link between man and nature. They remind us that gaining distance from the discord of our everyday lives and taking time to unplug and rejuvenate grows ever more important in our contemporary culture. “My hope is that the work will generate a wider dialogue celebrating the relationship between man and the wilderness in the 21st century,” White confirms. The portraits in Black Dots benefit from this same extended timeframe. “I find with portraiture there's a different interaction between myself and the sitter,” the artist explains. “There's usually quite a long time between the initial ‘Can I take your portrait?’ to the final click of the shutter, so the awkward 'deer in the headlights' pose that most people adopt gently subsides, and they sink into a more natural position.” The men in White’s images are unknowable, physically distanced from the viewer by the placement of a stone wall and window, or the darkness that threatens to envelop them. 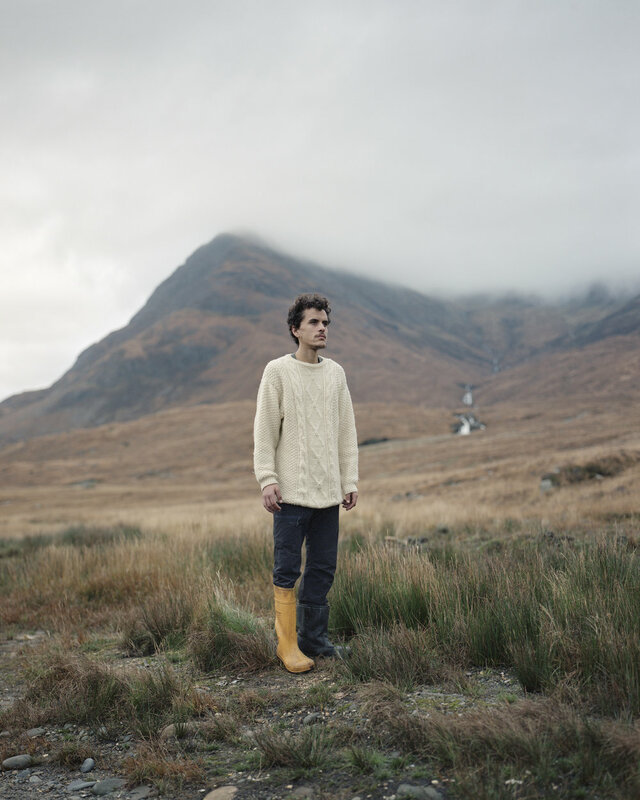 In “Giles at Camasunary Bothy, Isle of Skye, Scotland,” a young man, in a cream-colored knit sweater stands in the middle ground. His gaze is turned away and his silhouette is framed by the rugged landscape. His physical distance in the composition emphasizes his mystery. These men appear merely as features in the distant and enigmatic landscape, as unknowable as the mountain ridges and mysterious as the dark valleys beyond. Running contrary to contemporary culture, distance is embraced in White’s work. As a result, Black Dots is mysterious, distinct, and alluring.